ENGINEERING. PRACTICE. POLICY. 43 October/November 2018 unmanned systems inside The only proven lasting way of preventing bird strikes is by using raptors such as falcons to scare away other birds. Chung and his colleagues tested their algorithm in experiments where they attempted to use a quad-rotor drone to herd flocks of egrets and loons in Daejeon, South Korea. to record the trajectories of the herder drone and the birds. The best results occurred when a drone f ly- ing toward a f lock gave the birds enough time and distance to steer away horizontally from their original course. If a drone approaches a f lock too abruptly, the birds may break or sud- denly divert vertically, but still ultimately f ly toward their original destination. "We have validated for the first time that we can effectively herd a f lock of live birds moving in a three-dimensional world using a drone," Chung said. "The aerial robotics community has drawn a lot of inspiration from birds, both in terms of f light dynamics and in terms of f locking behaviors," said Magnus Egerstedt, chair of the Georgia Institute of Technology's school of electrical and computer engineering in Atlanta, who did not take part in this research. "To see the field come full circle, where we not only draw inspiration from birds but actually use these ideas to interact with and control bird f locks, is both amusing and exciting." THE FUTURE OF HERDING In principle, any conventional drone could perform such herding, Chung said. "This is one important step toward automating a drone- based approach to herd f locks of live birds," Chung added. Only the number and size of the incoming birds limit the effectiveness of the algorithm, Chung said. The researchers plan to explore ways to scale this project up for multiple drones interacting with multiple f locks. "I consider this to be a first promising step," Egerstedt said. "Future work will have to be more explicitly informed by actual f locking bird behaviors to reach its full potential." Currently, drones are generally not allowed to operate near airports, said David Hyunchul Shim, an associate professor of electrical en- gineering at the Korea Advanced Institute of Science and Technology in Daejeon, South Korea. To steer birds away from airfields using drones, "there should be some special arrange- ments made with the airports," said Shim, who took part in the bird-herding drone research. "I recently talked to Incheon airport au- thorities in Korea, and they were interested in our work for potential applications," Shim added. "Currently, they use hunters with rif les to scare birds away, or sometimes they actually shoot them down so that the birds can real- ize the rif les are a real threat. Birds are smart, and they get easily desensitized for non-lethal threats such as scarecrow or blank shots." I recently talked to Incheon airport authorities in Korea, and they were interested in our work for potential applications." 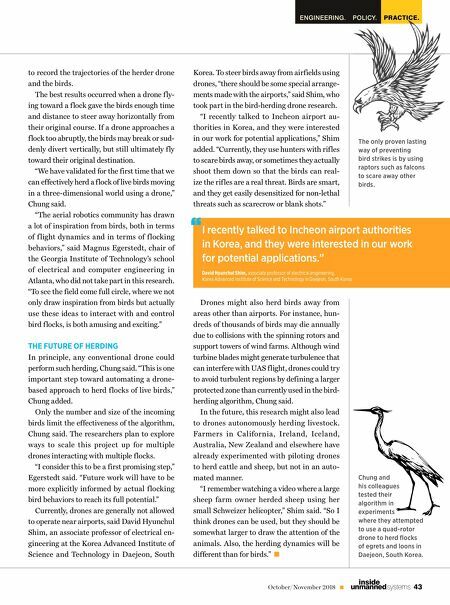 David Hyunchul Shim, associate professor of electrical engineering, Korea Advanced Institute of Science and Technology in Daejeon, South Korea Drones might also herd birds away from areas other than airports. For instance, hun- dreds of thousands of birds may die annually due to collisions with the spinning rotors and support towers of wind farms. 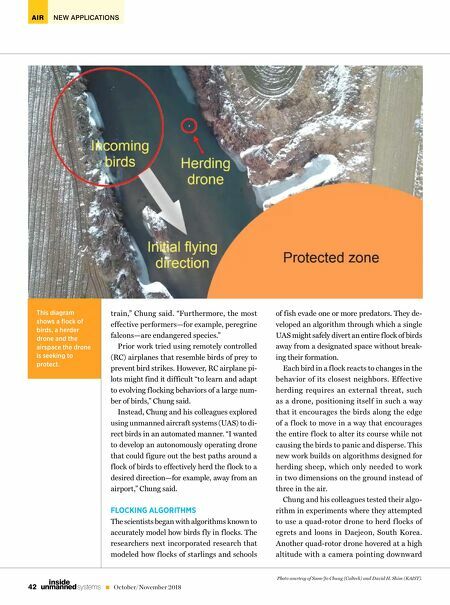 Although wind turbine blades might generate turbulence that can interfere with UAS f light, drones could try to avoid turbulent regions by defining a larger protected zone than currently used in the bird- herding algorithm, Chung said. In the future, this research might also lead to drones autonomously herding livestock. Farmers in California , Ireland, Iceland, Australia, New Zealand and elsewhere have already experimented with piloting drones to herd cattle and sheep, but not in an auto- mated manner. "I remember watching a video where a large sheep farm owner herded sheep using her small Schweizer helicopter," Shim said. "So I think drones can be used, but they should be somewhat larger to draw the attention of the animals. Also, the herding dynamics will be different than for birds." "